India's Most Respected Business Newspaper, the Economic Times, Names Zoomcar as One of India’s "15 Hot Startups for 2015"
Early Zoomcar investor and Chair of the Wharton Statistics Department: "Zoom is perfectly poised to open self-drive access to a huge new market. Led by two brilliant visionaries, its long term upside potential is simply staggering." The "Zipcar of India" was again named one of the most exciting startups in India by The Economic Times, India's top business and finance newspaper. Zoomcar is the only company to appear on the ET's "Hottest Startups" list two years in a row. The company launched in Bangalore in February 2013 with 7 vehicles, and has since grown to over 500 cars at about 75 locations around Bangalore and Pune. Zoomcar also launched in the Delhi suburb of Gurgaon in December 2014, and is quickly scaling up across the capital region. Zoomcar was founded by two Americans, Denver native David Back and New Yorker Greg Moran. The two met as freshmen at the University of Pennsylvania in 2003. Both dropped out of fully-funded MBA programs to launch the car-sharing company, David at Cambridge in the UK and Greg at USC in LA. David had previously graduated from Harvard Law School after stints in energy policy and entrepreneurship, while Greg had pursued a career in energy finance on Wall Street. 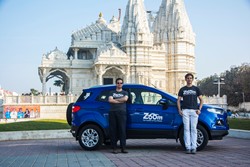 Zoomcar was the first car-rental company in India to focus exclusively on "self-drive". Over 95% of the industry is chauffeur-driven, with western-style car rental options existing largely in the unlicensed and unregulated informal economy. The $4 billion Indian car rental industry is growing by nearly 15% per year, while the self-drive segment is doubling year-on-year. "The opportunity here is astronomical," explains Zoomcar Co-Founder and President David Back. "Around the world, our business model thrives in ultra-dense cities with low rates of car ownership. By 2030, India will have 68 cities with populations over 1 million, while all of Europe only has 35 such cities." Other developing countries are also seeing a transition away from chauffeur-driven car rental and towards self-drive, with car-sharing companies achieving great success in Korea, Mexico, Brazil, Turkey, and elsewhere. China’s largest pure-play car rental company, China Auto Rental, launched in 2007, and now has over 50,000 vehicles. Former US Treasury Secretary Lawrence H. Summers stated, "I am proud to have been an angel investor behind Zoom. In a developing, dense country like India, there is even more benefit from automobile sharing. Zoom has the potential to help consumers, to help the environment and to empower Indian businesses." Zoom has raised a total of $12M from Sequoia, Silicon Valley Bank, Empire Angels, FundersClub, Triangle Growth, Globevestor, Basset Group, and others. Early Zoomcar angel investor Professor Ed George, the Chair of the Statistics Department at Wharton, enthused "Zoom is perfectly poised to open self-drive access to a huge new market. Led by two brilliant visionaries, its long term upside potential is simply staggering."